Portland Bureau of Transportation says the test drive will last one year and will gather feedback. Portland's experiment with shared electric scooters will return for a year-long sequel, officials say. The Portland Bureau of Transportation will solicit feedback on issues such as unlawful sidewalk motoring, improper parking and the lack of required helmets during the expanded e-scooter trial program that will begin this spring. 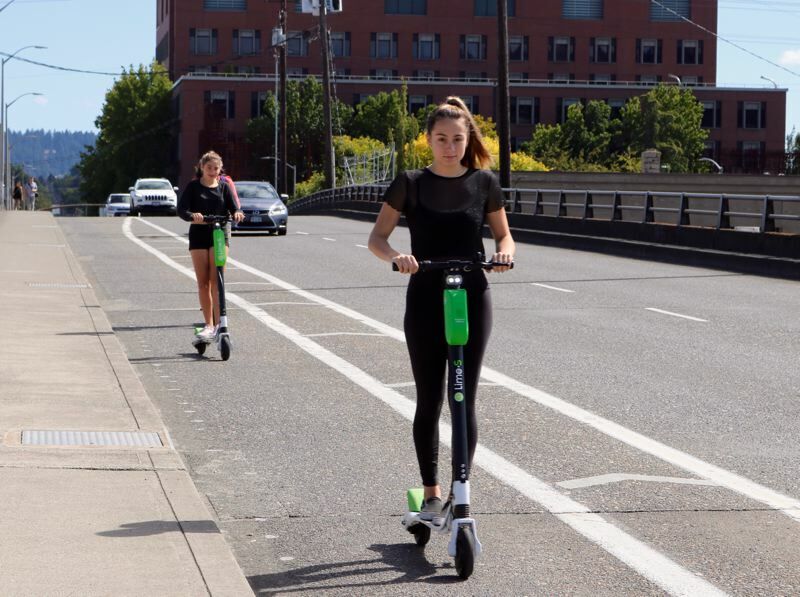 "I'm glad that PBOT took a proactive approach, requiring e-scooter companies to share their data and to serve East Portland," said Chloe Eudaly, who oversees the bureau, in a statement. "We will continue to seek public input on how to best serve all Portlanders." Residents and tourists made 700,369 two-wheeled trips traversing some 801,887 miles using about 2,000 scooters during the previous 120-day test drive that ended Nov. 20, according to the new "2018 E-Scooter Findings Report" released Tuesday, Jan. 15. The 36-page document states that the average trip length was about 1.15 miles, bumping up to 1.6 miles in East Portland. In fact, maps created with tracking data show some sure-footed riders were zipping along imposing autoways in East Portland, including 122nd Avenue, Division Street and Glisan, Burnside and Stark streets east of 102nd Avenue. Many of the most traveled streets were part of the city's bike-friendly network or located downtown, however. Jeanne Harrison, transportation committee chair for the Northwest District Association, is still reserving judgment on the scooter lifestyle. "If people find out they can have fun without driving around in a car, that's very positive," said Harrison, who has lived in the Alphabet District since 1987. "There needs to be better enforcement to make sure all the riders are riding safely." She's seen some electric scofflaws park their rides in the middle of the travel lanes on Burnside Street, and is also bothered by parents who let their young children hop on. Hospitals reported an increase in scooter-related injuries, though most wounds didn't require a ride in an ambulance. E-scooters made up about 5 percent of the 3,220 total traffic crash injuries reported within city limits — generating 176 ER and urgent care visits. Of those visits, 83 percent occurred after a rider fell off a scooter. In about 16 percent, first responders found evidence of intoxication. In addition to the ER data, PBOT says it received 43 reports of e-scooter collisions. In the same time period, cyclists required 429 visits to the emergency room. "After reviewing emergency department and urgent care clinic data, we found that e-scooters have risks similar to other parts of the transportation system," said Multnomah County Environmental Health Director Jae Douglas. "We did not find a disproportionate risk that would discourage the city from allowing a scooter ride-share pilot." The three companies who participated in the last test — Lime, Bird and Skip — attest to having paid out $643,000 in wages to the 1,533 independent contractors who were hired primarily to re-charge the electric scooters at night. And while it is illegal to ride an e-scooter on a sidewalk or without a helmet, officials admit that those laws are honored more in the breach than the observance. While staking out seven locations across Portland, PBOT staff monitored 128 users — and observed that 90 percent of riders do not wear helmets. They also saw that riders increasingly take refuge on sidewalks as speed limits rise, with up to 66 percent staying on the walkway when the speed limit for drivers was 35 miles per hour. That said, 72.8 percent of observed riders parked their e-scooter correctly, without blocking pedestrian movement, bus stops, placing them on private property or blocking accessibility improvements for people with disabilities. The bureau says e-scooters replaced approximately 301,856 vehicle miles. "While this technology has the potential to reduce congestion and pollution," Eudaly noted, "I remain concerned about the unlawful use of e-scooters on sidewalks and in city parks, and the impact of e-scooters on people with mobility challenges or vision impairment."